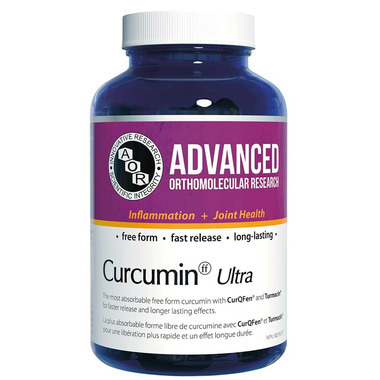 AOR Curcumin Ultra provides unparalleled absorption and bioavailability, resulting in the highest levels of bioactive free form curcumin on the market. It represents a new approach, combining multiple compounds from turmeric for more well-rounded support. Dosage: Take 1 per day. Ingredients: Curcumin (CurQfen), Tumeric (Turmacin), coconut oil, silicon dioxide. Non-Medicinal Ingredients: Gelatin, glycerin, purified water, curcumin, calcium carbonate. Contains no wheat, gluten, corn, nuts, peanuts, sesame seeds, sulphites, mustard, soy, dairy, eggs, fish or shellfish. Caution: Consult a health care practitioner prior to use if you are pregnant, taking antiplatelet medication or blood thinners, or if you have gallstones, a bile duct obstruction, stomach ulcers or excess stomach acid. Consult a health care practitioner if symptoms persist or worsen.